We’re excited to unveil our new blog at the same time we are unveiling our new studio facade. My assistant Deb Weaver and I picked the colors to match our logo. The new facade reflects our love for color and whimsy. 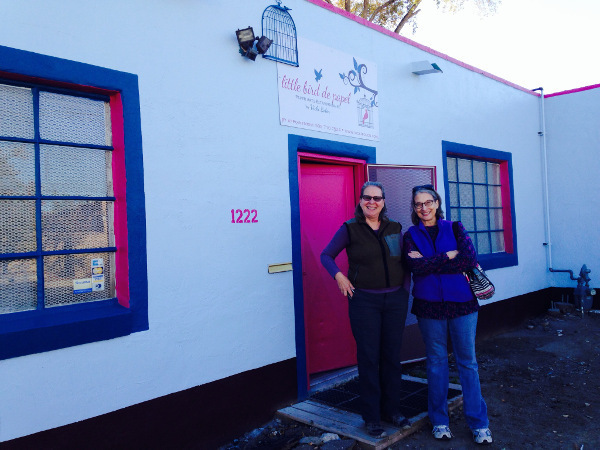 We are located in a walking neighborhood just east of Albuquerque’s Old Town and Museum district. Our neighbors and those walking through our neighborhood have been dropping by, curious to see what is going on in our studio. We celebrated the holidays with a 12 Days until Christmas Open Studio…you guessed it, during the 12 days before Christmas! In addition to sales on many handmade gift items, we held several “make and take” workshops. Many of our friends and customers came by to make hand-pulled prints, Christmas ornaments and pinch pots. But what really excited us were the people who found out about our event on Facebook and joined us The creative energy was fun for all. We look forward to sharing Little Bird de Papel’s creative journey with you in person and through this blog. 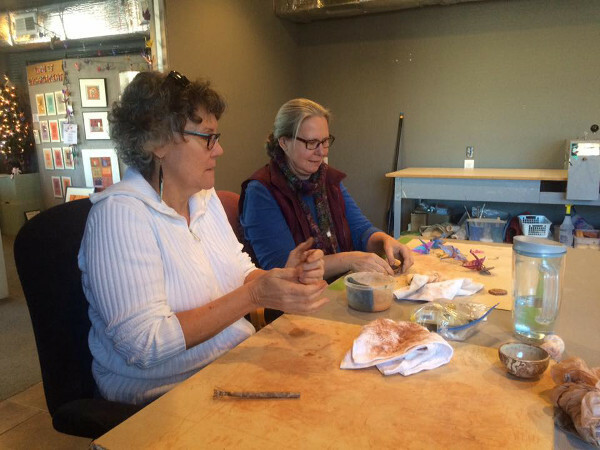 Vicki Bolen and Connie Cox making pinch pots at the Little Bird de Papel studio.